Černé plastové pouzdro + stavitelný držák pro přístroje Autometer Ø 67 mm. 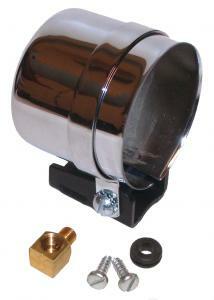 Instrument mounting cup chroom for Autometer Ø 67 mm. Auto Meter instruments enclosure, smaller Auto Meter instruments are mostly suitable to mount in the dashboard, but if you prefer to place the desired instrument on the dashboard, this can also be one of those black, chrome or manufactured from carbon housings. For the larger instruments, there is only one carbon housing that the instrument will give a more luxurious appearance. The diameter of the instrument is shown to indicate where the housing is suitable. Are each supplied with adjustable mounting feet.